Red River (1948) is a classic and complex western (and considered by many critics to be one of the ten best westerns ever made). It is a sweeping, epic story about a cattle drive (historically based on the opening of the Chisholm Trail in 1867) and a film of rivalry and rebellion, spanning a time period of fifteen years. Red River was Howard Hawks' first western, a story often compared to its parallel epic on the high seas, Mutiny on the Bounty (1935). Later westerns he directed included The Big Sky (1952), Rio Bravo (1959), El Dorado (1967), and Rio Lobo (1970). Hawks was well known for his storytelling and his versatility in film genres, spanning screwball comedies (Bringing Up Baby (1938) and His Girl Friday (1940)), romantic comedies (Twentieth Century (1934)), crime/gangster films (Scarface: Shame of the Nation (1932)), mystery-detective noirs (The Big Sleep (1946)), adventure films (Only Angels Have Wings (1939)), and war films (The Dawn Patrol (1930)), to name a few. Its metaphoric title was deliberately chosen to evoke the Biblical exodus, another journey in which a group of Israelites leave their familiar homeland and cross the Red Sea into unknown territory. By film's conclusion, the cattle herd are successfully brought to market on the new Chisholm Trail, and the two men are reconciled after a brutal brawl. The tough woman in the film, Tess (Joanne Dru), steps in and breaks up their final fight to the death with a gun. In the long run, this production brought both critical acclaim and financial success. Two Academy Award nominations were received: one for Borden Chase's story, the other for Christian Nyby's Film Editing. It was undervalued due to its being a western - John Wayne, Montgomery Clift, director Hawks, and score writer Dimitri Tiomkin should have - at least - received nominations. Wayne (and Walter Brennan as his sidekick) would go on to make another western with Hawks a decade later - Rio Bravo (1959). Among the annals of the great state of Texas may be found the story of the first drive on the famous Chisholm Trail. A story of one of the great cattle herds of the world, of a man and a boy - - Thomas Dunson and Matthew Garth, the story of the Red River D.
Fen: Please take me with you. I'm strong. I can stand anything you can. Fen: Too much for a woman? Put your arms around me, Tom. (They hug and kiss each other.) Hold me. Feel me in your arms. Do I feel weak, Tom? I don't, do I? Oh, you'll need me. You'll need a woman. You need what a woman can give you to do what you have to do. Oh listen to me, Tom. Listen with your head and your heart too. The sun only shines half the time, Tom. The other half is night. Go, please. If you're going to go, please go now. I want to be with you so much. My knees feel like...like they have knives in them. Bye. Dunson is resigned to stay where they are, thinking it useless to turn back: "it would take us hours to get back there." Groot reinforces what Dunson must be thinking: "We shoulda took her along." [Fen's opinion about joining them is paid for with her life.] They camp that night with their backs to the river for protection. After hearing bird calls (as signals) before an impending Indian attack, they take a stand against a small war party of Comanches. One of the braves jumps on Dunson and propels them both into the river where they engage in a life-and-death wrestling match. Groot tosses a knife to his comrade and Dunson stabs the Indian to death underwater (punctuated by musical chords). 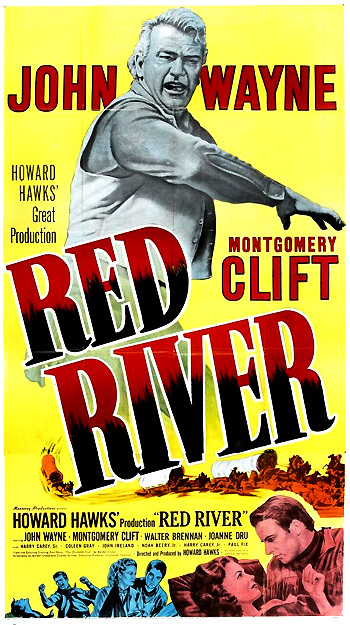 [Although the film is black and white, the Indian's red blood inevitably ran into the river - the Red River.] The bracelet that he gave Fen is found on the slain Indian's wrist - and symbolizes her death. The dead brave is obviously the one responsible for his fiancee's demise. It is a shock to Dunson to learn of her death and he is hardened by it. Again, Groot reacts with dismay and sympathetically expresses Tom's thoughts: "Oh Tom, that's too bad. We shoulda took..." Dunson slips the bracelet onto his own wrist. The next day under a swarm of vultures, they find a stunned young boy, Matt (Micky Kuhn as the young boy) wandering aimlessly and leading a cow behind him. He is the sole survivor of the wagon train massacre and mumbling crazily to himself: "It was all burnin', only Indians around, just all burnin' and smokin', smellin'. They were burnin' everything. I can see it. It's plain. I can see it. It was burnin' the wagons. People was screamin'." He escaped the massacre when separated from the wagon train while retrieving a cow miles away in the brush. Dunson: Yeah, well, it looks like we'll have to take you along. (He returns the gun to the boy, expressing his confidence in the lad.) (taunting) Well, are you gonna use it? Dunson: (to Groot) He'll do. Dunson (gesturing toward the land): To me! Some day, that'll all be covered with good beef. And I'll put a mark, a brand on 'em, to show they're mine too. I've been thinkin' about that. There'll be two lines, like this, like the banks of a river. It'll be the Red River brand. Dunson: Pretty unhealthy job. (He backs up and warns Matt.) Get away, Matt. In a primitive ceremony under the vast sky, they bury the slain Mexican and Dunson reads a short passage from the Bible over the dead man's grave - marked with a cross: "We brought nothing into this world, and it's certain we can carry nothing out. The Lord gave and the Lord hath taken away. Blessed be the name of the Lord. Amen." In the foreground of the low-angle shot is a branding iron pointing toward the grave. After Dunson's male bull and Matt's female cow are branded, they are untied and set free - they will go on to produce the herd for the ranch on this new domain of land. Dunson kneels: "Wherever they go, they'll be on my land. My land. We're here and we're gonna stay here. Give me ten years and I'll have that brand on the gates of the greatest ranch in Texas."